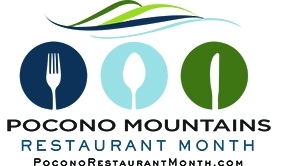 Join Karen on Wednesdays to celebrate Pocono Mountains Restaurant Month! Get your first ever “Taste of the Poconos” with the Pocono Mountains Visitors Bureau and the Chambers representing the four counties of the Pocono Mountains: Wayne, Pike, Monroe and Carbon in northeastern Pennsylvania. We want to invite restaurant goers to the area can enjoy a unique signature dish, special, or deal during the month. Visit the following participating Pocono restaurants and try one of their enticing specials!